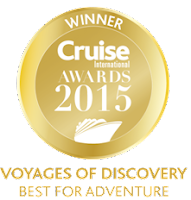 Voyages of Discovery beat five leading cruise brands to claim the 2015 Cruise International Award for the best cruise line for Adventure. Voyages of Discovery offers Small Ship Discovery Cruising with the opportunity to choose what you want from your holiday. On board guest speakers bring to life each destination which can be experienced with both inclusive and optional excursions. Liz Jarvis, Editor of Cruise International, said: "The Cruise International Awards 2015 are voted for by the people who go on cruises and the results are a real insight into consumer opinion. With new cruise lines making an impact in 2015 this year's results have been very interesting. The cruise industry continues to go from strength to strength and we're delighted to be able to play our part in recognising the extraordinary achievements and incredible innovation of this amazing industry." Andy Harmer, Director of the Cruise Lines International Association, added: "The Cruise International Cruise Awards are very much an integral part of the cruise calendar and it's great to see cruise lines, agents and others recognised for their outstanding service by those who matter – the consumers. The thousands of votes for the Awards bear testament to the passion shown by those holidaymakers with a love for everything cruise." Click here, to download a copy of the Voyages of Discovery 2016/17 brochure. For more information, prices and bookings, please contact your local Travel Agent or Discover the World on 1800 (623 267) OCEANS or email voyagesofdiscovery@discovertheworld.com.au.